and whose origins remain unknown. If you have any mystery team photos, send me an email with the picture attached, or send me an email to arrange a way for you to submit the picture. This photograph was purchased in 1998 at Cottage Antiques in Ellicott City, MD. 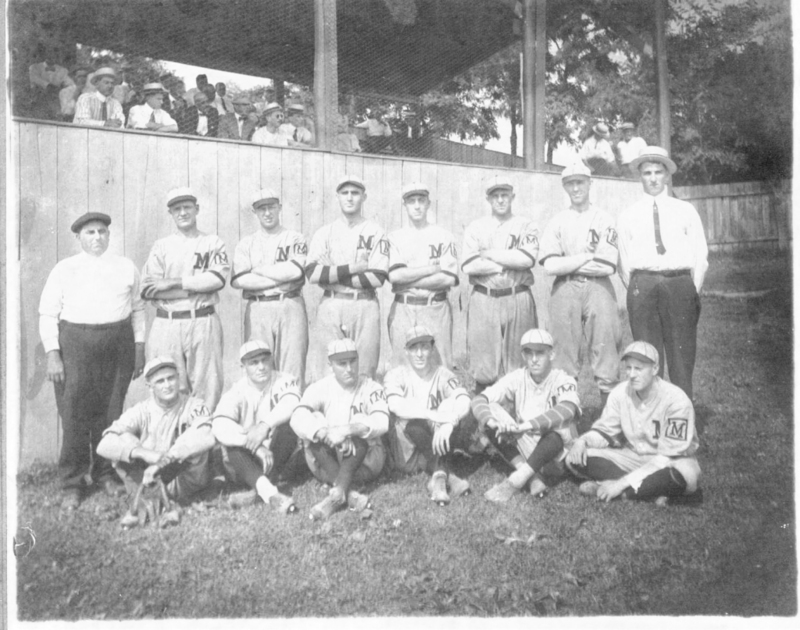 The image shows a baseball team with an M inside a square on their left sleeve and another M on their chest. The players appear to be older then a high school team but they could possibly be a college or even a company ballclub. Judging broadly from the thick cardboard backing, the photograph would have been printed sometime between 1910 through 1930. The trees are full of leaves in the background so the picture was possibly taken sometime between late May and early September. This particular ballpark seems to have a very nice enclosed grandstand and straw hats were quite popular with the fans. Check back later for more Mystery Photos.